One of the things I love about Twitter is how sometimes it throws up something that really resonates with where I am at the moment. The other day it was Stephanie's post about her #blogaday challenge. 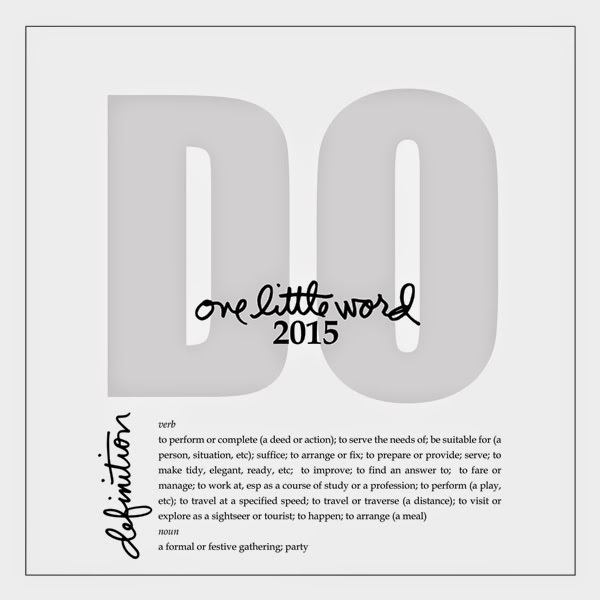 Today, it was a link to this post by Lisa Dabbs about the One Little Word challenge. I thought that this sounded familiar. Sure enough, Lisa linked through to Ali Edwards' site. I knew Ali from my scrapbooking days. I own several of her books and even met her when she came to NZ in 2006. I remember when she started her One Little Word challenge. It didn't grab me then. Just the pressure of choosing a word to live with throughout the year seemed too much. So I forgot about it and got on with things. Fast forward to 2015 and a few life changes. I suddenly realised when I saw Lisa'a post that this was what I wanted as a focus for the year. Not a bunch of random resolutions that I would probably forget about in a month or two. Rather a word I could hang reflections on and that would (hopefully) spur me to do what I needed to do. And there it was. The word. DO. Somehow, it just felt right. It is a very small word but I think a good one to go forward with in 2015.